I secretly love wearing all the things my human knits … and find it amusing that she likes to balance things on my head for fun. 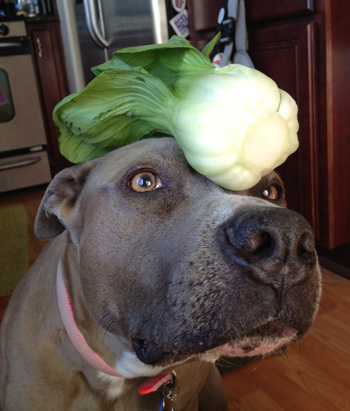 In fact, my human recently made a book of all the foods we like to eat – all of them balanced on my head! Us pit bulls get a bad rap, but we’re just as fun loving and silly as the rest of our four-legged friends. Ha ha ha. Some dogs will do ANYTHING..
@skreidle We know!!! Too cute! I ove this. It brought me to tears. I played head games with my prozed pooch Luna daily. She passed and these photos just remind me so much of my girl. Love them and miss her. : ) Thanks for the tears of joy and tickle. @ColleenSafford You’re welcome, and we are sorry for your loss, but Luna will always live in your heart. You look fabulous in that blue scarf and very hipster with your glasses ! !